Jonathan Edwards married Sarah Pierrepont on July 28, 1727. Jonathan and Sarah were as different in personalities as they were similar in convictions. He was the introverted scholar, content to spend hours in his study; she was the extrovert who enjoyed being with others. Both were deeply committed to Christ. Jonathan followed God’s call to become a minister. Shortly thereafter, he and his young bride began a pastorate in a small congregation. Sarah was more than a minister’s wife; she was a full partner in her husband’s ministry. During the following years, the Edwards had 11 children. Jonathan wrote many sermons and books. He was perhaps best known for his sermon, “Sinners in the Hands of an Angry God.” American historians point to Jonathan’s influence in the First Great Awakening. The effects of the Edwards’ lives are far-reaching, but the most measurable results of their faithfulness to God is found through their descendants. A study conducted by A. E. Winship in 1900 lists a few of the accomplishments of the Edwards descendants: 100 lawyers and a dean of a law school, 100 missionaries, 80 public servants, 66 physicians and a dean of a medical school, 65 college professors, 13 college presidents, 30 judges, three mayors of large cities, three governors, three senators, and one vice-president. You may not have heard of this colonial couple, but you can see their legacy far exceeded anything they could have imagined. Merriam-Webster defines legacy as “a gift by will especially of money or other personal property.” As you can see, legacy is commonly associated with an amount of money or property left to others in a will. 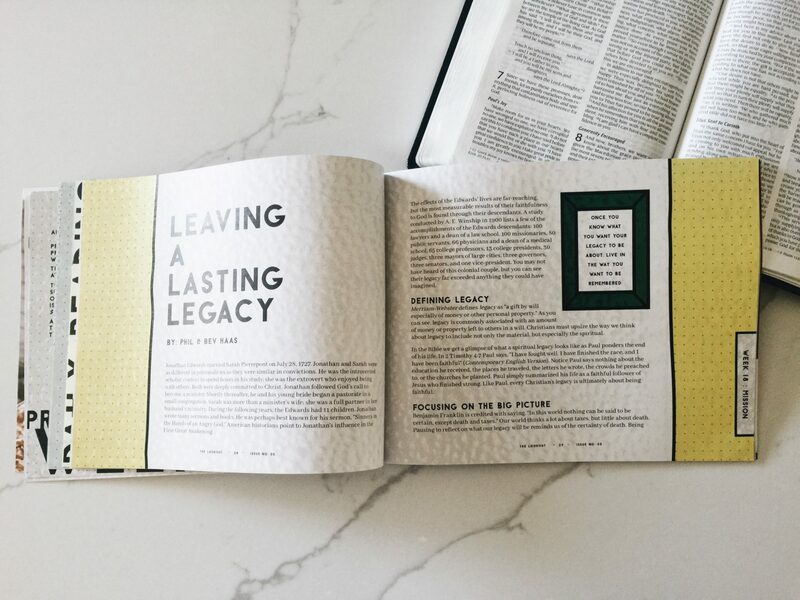 Christians must upsize the way we think about legacy to include not only the material, but especially the spiritual. In the Bible we get a glimpse of what a spiritual legacy looks like as Paul ponders the end of his life. In 2 Timothy 4:7 Paul says, “I have fought well. I have finished the race, and I have been faithful” (Contemporary English Version). Notice Paul says nothing about the education he received, the places he traveled, the letters he wrote, the crowds he preached to, or the churches he planted. Paul simply summarized his life as a faithful follower of Jesus who finished strong. Like Paul, every Christian’s legacy is ultimately about being faithful. Benjamin Franklin is credited with saying, “In this world nothing can be said to be certain, except death and taxes.” Our world thinks a lot about taxes, but little about death. Pausing to reflect on what our legacy will be reminds us of the certainty of death. Being reminded of death can be a good because death puts life in a wider context and helps us focus on the bigger picture of what’s most important. Legacy is really about life and living. It helps us decide the kind of life we want to live and the kind of family and world we want to live in. The question we need to ask ourselves is not, “Will I leave a legacy?” but “What kind of legacy will I leave?” Have you ever watched a relay race? If so, you know they are usually won or lost in the transfer of the baton. If either runner fails to complete a successful handoff, the race is lost. And so it is with the Christian life. Every generation of Christians must, like Paul, be determined to finish strong and get the baton into the hands of the next generation. There is nothing more tragic than failing to transfer the baton of faith to those who come after us or passing a baton that is empty of faith. We all want to leave our mark and to know that our life mattered. Too many mistakenly believe legacy is something that must impact the world at large. True, a few will leave that kind of mark, but the majority of us will not. Our influence will include our families, friends, and others in our smaller circle of influence. What if God’s plan for you is to be the best husband or wife, mom or dad, grandparent, teacher, or church volunteer you can be? What if God’s plan is for you to break a cycle of abuse or addiction in your family, to set a new course for future generations or to love someone others consider unlovable? As we look at our lives, our children are continuing what we began. Brian ministers to a church north of Atlanta; Amanda teaches middle school students. They love their families and we see them doing many acts we did. Friends tell us we’ve duplicated ourselves. They are our continuing legacy. When asked to identify the most important of the 613 commandments in the Old Testament, Jesus mentioned two: “You must love [God] with all your heart, soul, mind, and strength,” and “The second most important commandment says: Love others as much as you love yourself” (Mark 12:30,31, CEV). A lasting spiritual legacy begins in your relationship with God and continues in how you treat those around you, starting with your own family. Once you know what you want your legacy to be about, live in the way you want to be remembered. If asked to name two most common things on a tombstone after the deceased’s name, most would correctly list the date of birth and date of death. Unless you’re looking at a tombstone, you probably wouldn’t notice the line in-between. And even when you see it, you probably wouldn’t think about what that line represents. Linda Ellis helps us reflect on that line and our legacy in her poem, The Dash (www.thedashpoem.com, used by permission). He referred to the dates on the tombstone from the beginning . . . to the end. For it matters not, how much we own, the cars . . . the house . . . the cash. So, when your eulogy is being read, with your life’s actions to rehash . . .
Phil and Bev Haas have two adult children and seven grandchildren. They reside in Cincinnati, where Bev is a gifted intervention specialist and Phil is recently retired from a local church ministry.